British born singer/songwriter/musician Ed Sheeran is definitely enjoying his success. His latest album, "X" topped the charts in nine countries and his current tour has sold out arenas across the U.S., including the Mohegan Sun Arena on Saturday night. It was no surprise that the young, mostly female, audience was ready to give Sheeran all their energy by singing and dancing for the nearly two hours that Sheeran was on stage. Ed Sheeran walked onto a blank stage with only an acoustic guitar and immediately received a roaring response from the audience before saying one word or playing one note. Instead of using a backing band, Sheeran used a Looper board which allowed him to record sounds made from his guitar or vocals and replay them in a rhythmic pattern to give his songs substance. Also to help with his performance were fourteen giant video screens that would portray live shots of Sheeran masked with different artistic features. The evening of songs began with "I'm A Mess" as Sheeran would harmonize with himself, while the screams of the audience would drown out Sheeran's talking between songs. Ed Sheeran would mix in some cover songs with his own songs if the rhythm called for it as he did with "Don't," which lead into Blackstreet's "No Diggity" and "Take It Back" drawing inspiration for Stevie Wonder's "Superstition." One of the evening's highlights was the amazing rendition of "Bloodstream" as he commanded the audience to wave their hands up and down during the song's chorus. The thunderous rhythm of the song was a nice contrast to the quiet ballad of the heartfelt "Tenerife Sea." The audience almost out sang Sheeran during the smooth, mellow delivery of "The A Team" as cell phone lights lit up the arena. He closed his set with "Give Me Love" as his instructed all the voices in attendance to join him in unison of the song's chorus. After a very quick break, Ed Sheeran would return to the stage to a deafening applause to perform "You Need Me, I Don't Need You." He sprawled through the lyrics like a rapper before leading his fans into singing along to Izzy Azalea's 'Fancy." He would close the night with his big hit single "Sing" as Sheeran exited the stage with the audience singing the song's memorable chorus. 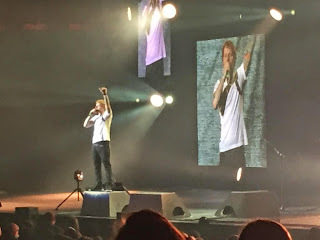 Seeing Ed Sheeran live gives new meaning to "one-man-show" as he keeps everyone involved in his performance. Also, his use of technology to crate a unique experience make his a must see in a live setting. Irish musician Foy Vance started the evening off with a 40-minute set that got the audience prepared for headliner Ed Sheeran.